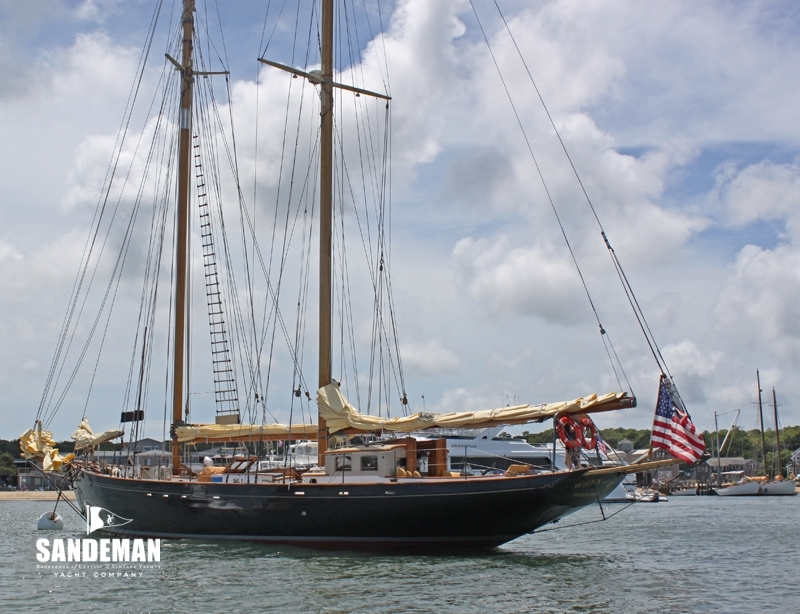 The iconic Alden schooner was built for General George S. Patton; intending to sail round the World on her – when and if he returned from World War II. He never fulfilled his dream but WHEN AND IF lived on. 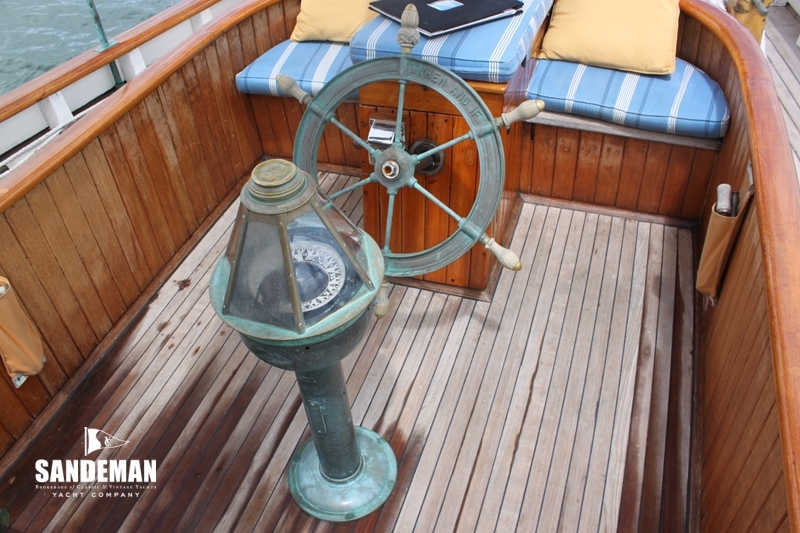 A strong deep short ended hull form offering security at sea, dry decks, easy motion but greater volume below than other yachts of this period. 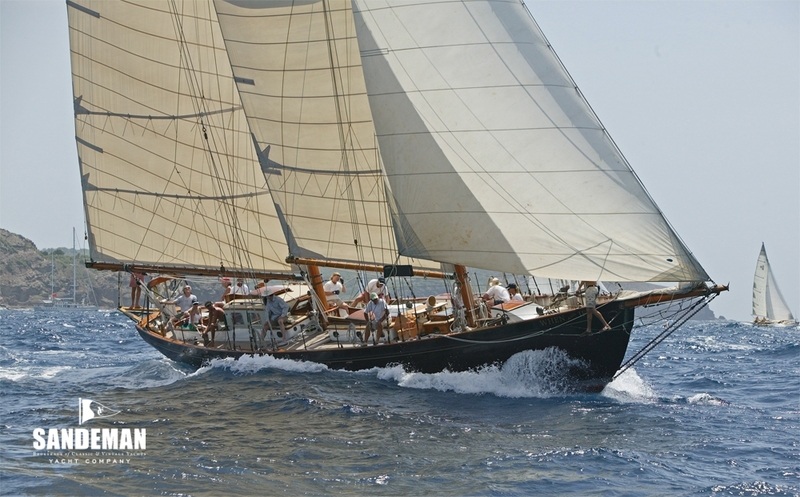 Of course a classic yacht – she has provenance and grace in spades but above all she is a true sailing boat as Alden intended and as at home offshore as she is a talking point at a classic regatta. 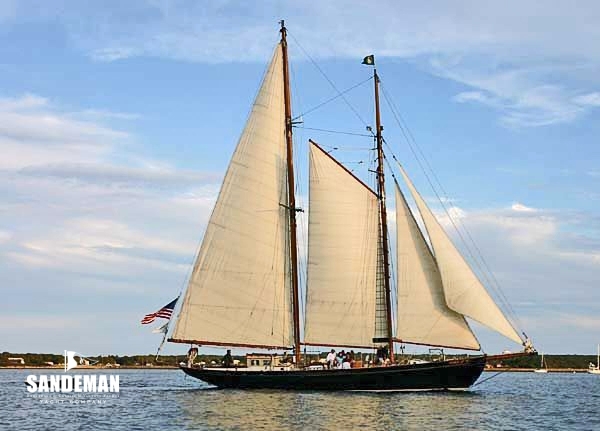 Although General George was to die; his dream unrealised, the yacht was sailed and much enjoyed by his family until the 1970s when she was donated to the Landmark School near Boston Mass. 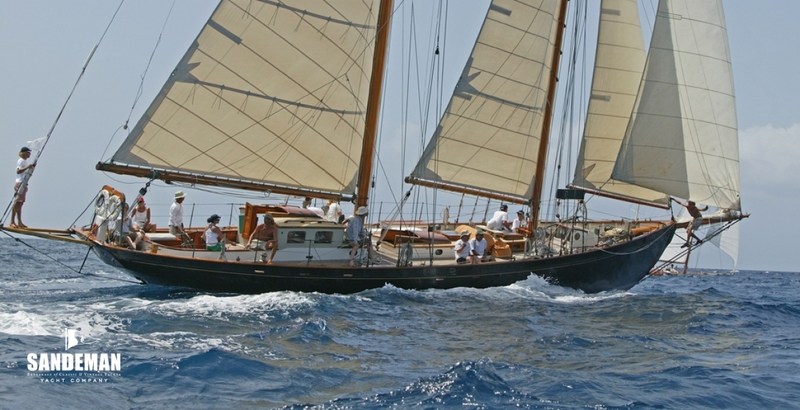 There she was to become an important element of the sail training programme for dyslexic children. 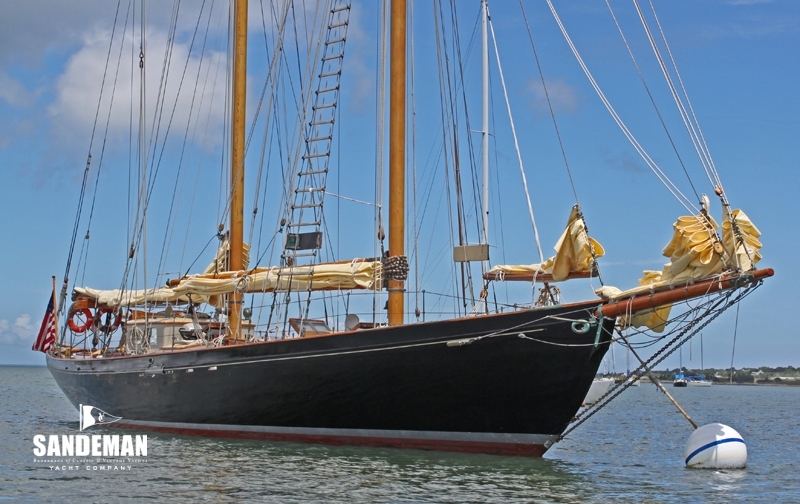 It was in 1990 that she broke loose from her mooring in a gale and wrecked. 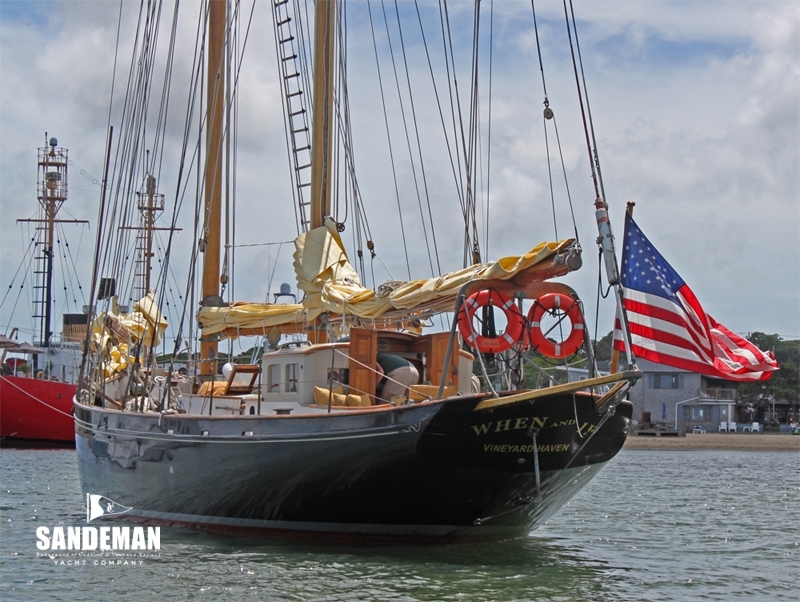 Although assessed a total loss by her insurers, she was successfully salvaged and taken by barge to Martha’s Vineyard. There she was painstakingly restored by Gannon & Benjamin one of the best yards in New England to be re-launched in June 1994. 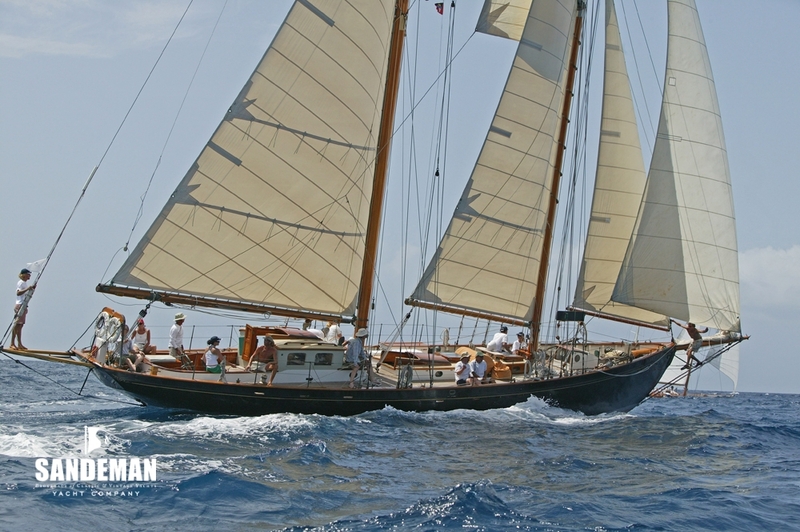 Since then this fine schooner has been a familiar sight at East Coast classic yacht events, symbolising the survival of what had been thought to be a dying breed. 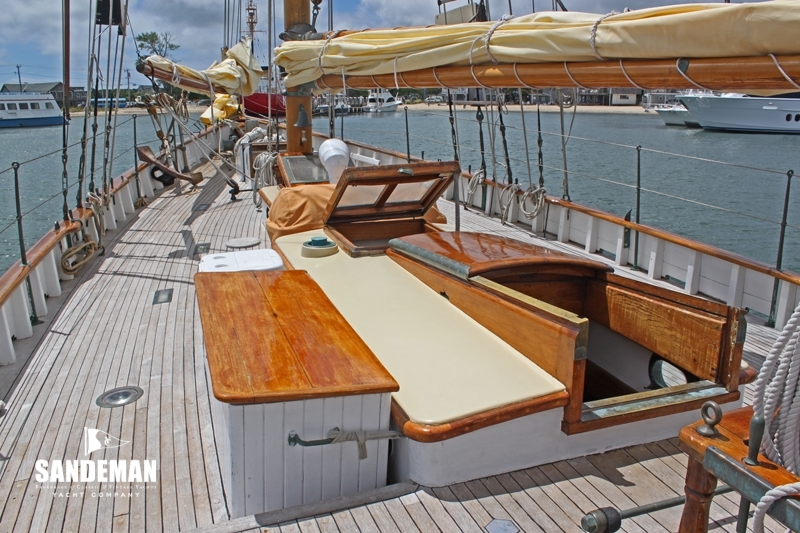 Her original construction was double planking (African mahogany over mahogany and cedar, bedded in white lead paste) over double sawn black locust frames, bronze fastenings throughout, on an oak backbone. She had bronze hanging knees, bronze sheet chain plates, bronze diagonal strapping, cast bronze floors (under the copper water tanks), and an oversized shelf, as well as sheer clamp. Her keel bolts appear to be naval bronze (during the rebuild two were replaced and subsequently two more in 1998 - all out of silicone bronze). Bronze helm wheel. 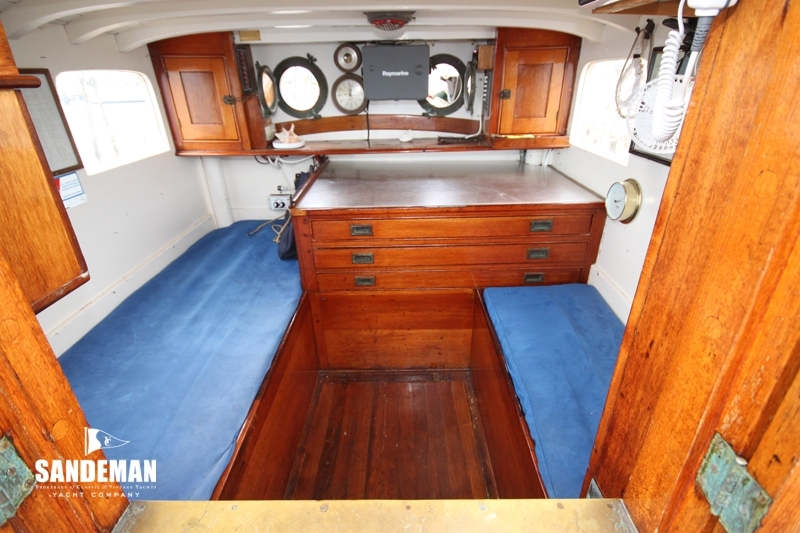 The doghouse with side windows and two portholes forward, which can only be accessed from the cockpit has short settee and longer settee berth with storage, chart table with drawers, navigation equipment, lockers, electrical panel and battery switches. 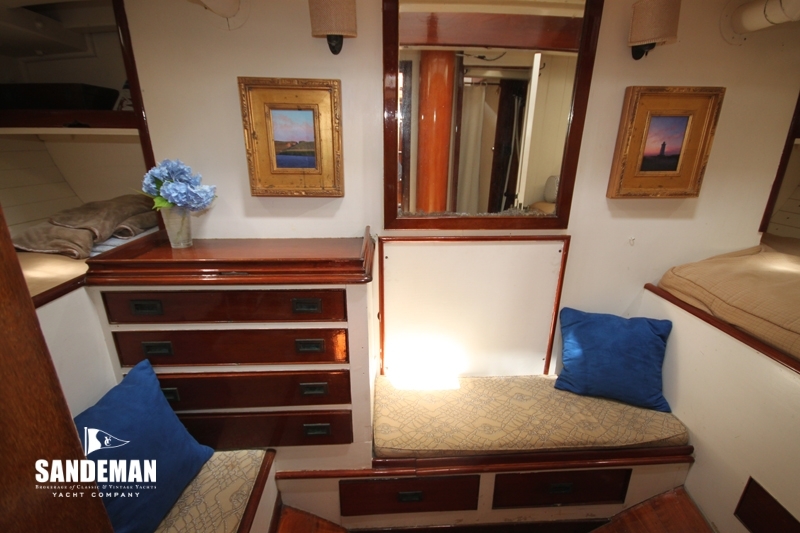 The main access to accommodation below is via companionway hatch and steps down and below; the cabins are painted off white with cypress bulkheads and mahogany trim. 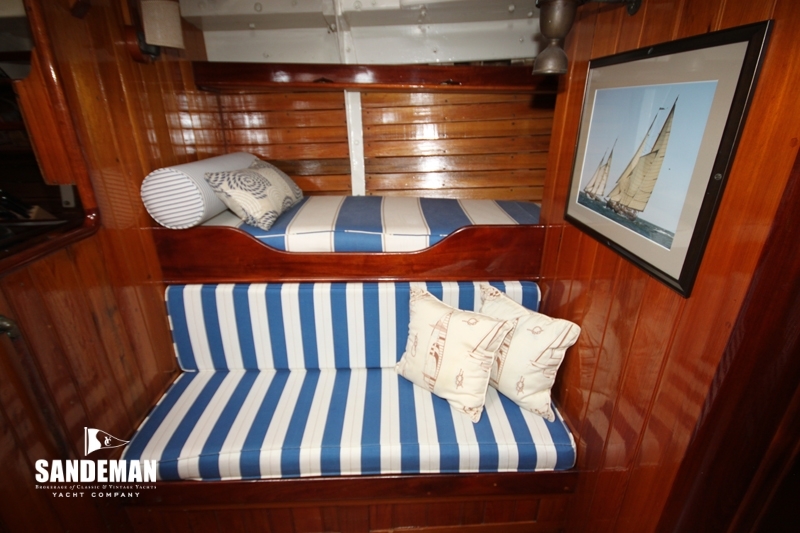 Upholstery is blue and white striped with numerous cushions. 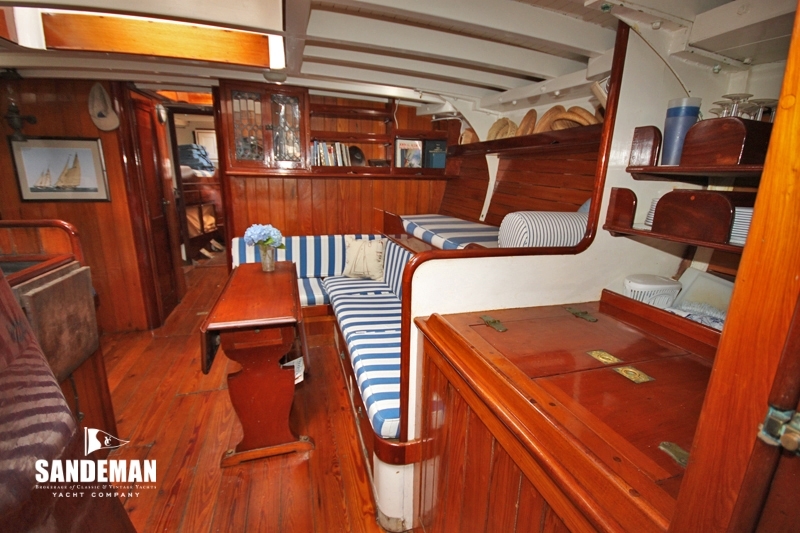 The full beam master cabin aft has to port a double berth and to starboard a ¾ pilot berth with settee. 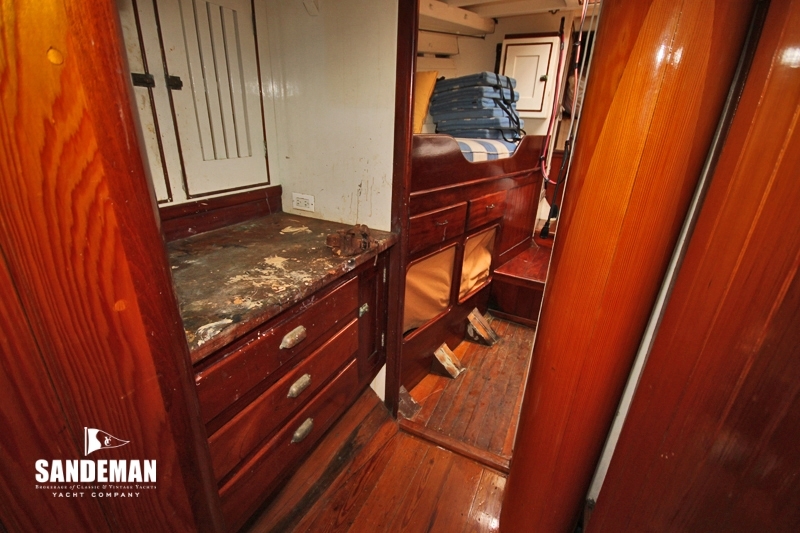 There are bureau, settee and mirror on the aft bulkhead, book cases and a large hanging locker with shelves. The hatch overhead and 4 x opening bronze ports give ventilation and light – additionally by kerosene lamp and electric lights. 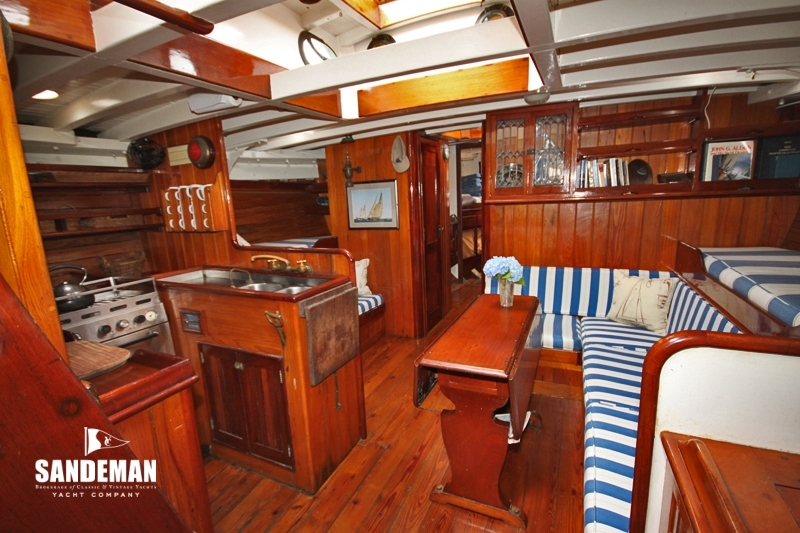 Cabin sole is of teak and holly. 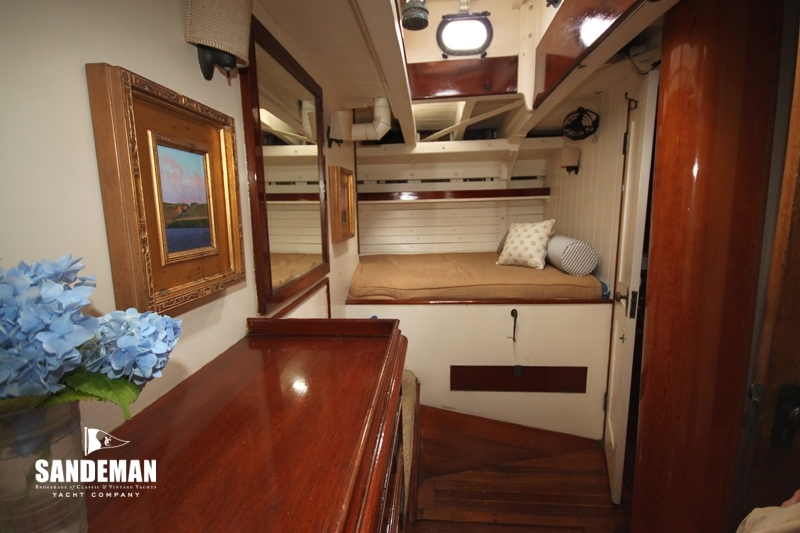 To port is a large head with double doors leading both to the corridor and the aft cabin. 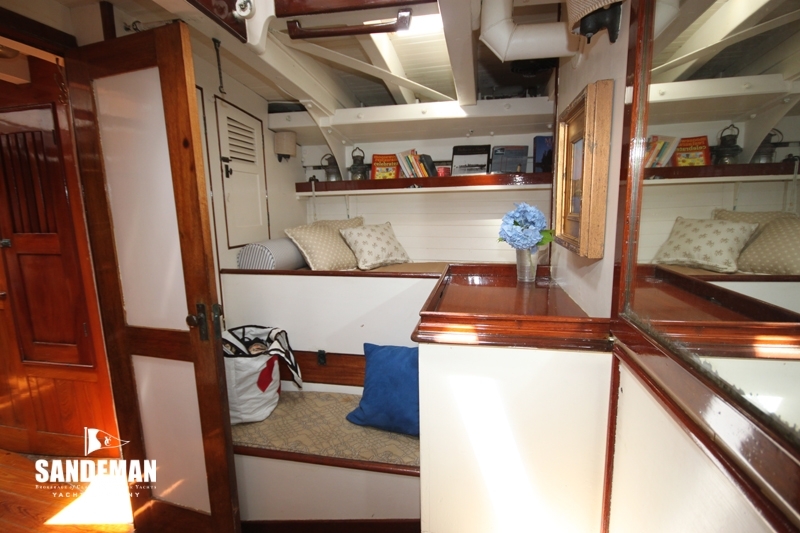 It has Wilcox manual WC, enclosed shower 12 gallon water heater, porcelain sinks and large locker under, medicine locker, linen lockers, vanity with mirror, deck prism for light, and ventilation through the accommodation hatch. 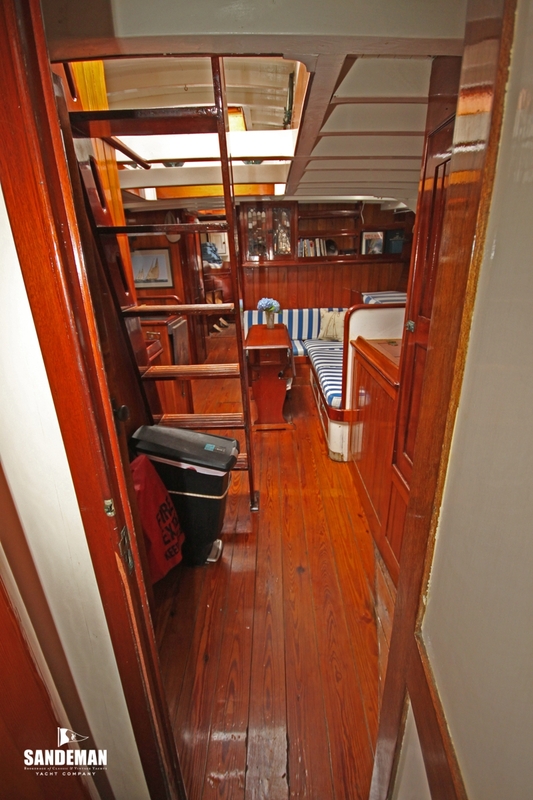 Moving forward between the head compartment and the foul weather gear locker to starboard is the accommodation hallway ladder and hatch. 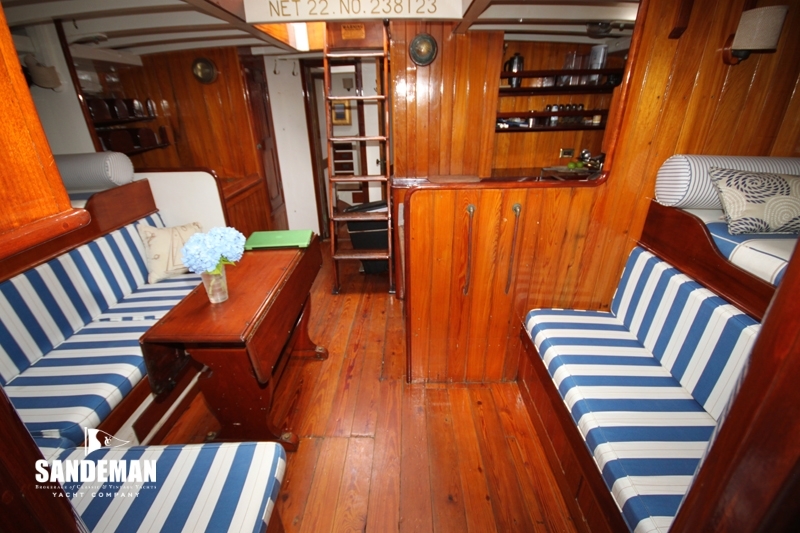 In the saloon forward are single pilot berths (curtained ) and settees both sides, table with two leaves, leaded glass locker, numerous book cases, lockers and bins. 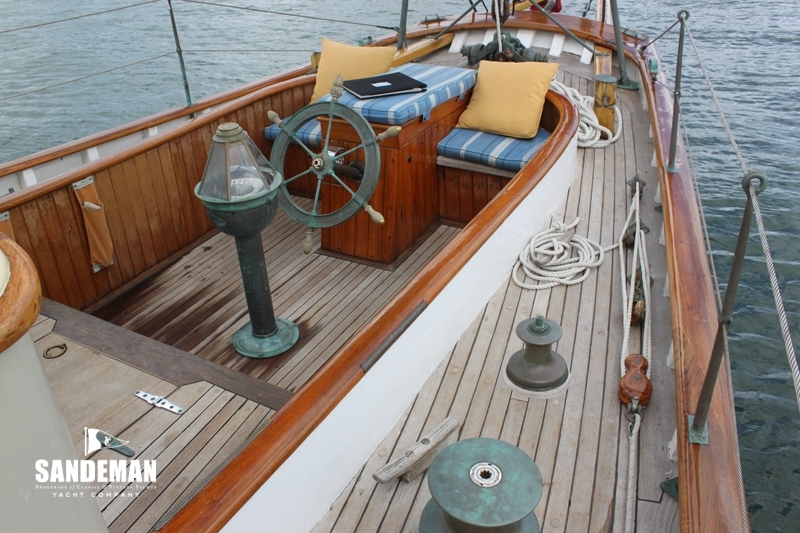 The copper diesel heater (c 2002) is to port; a large butterfly skylight and opening portholes in the cabin trunk give ventilation and light. The saloon has both electrical and kerosene lamps. 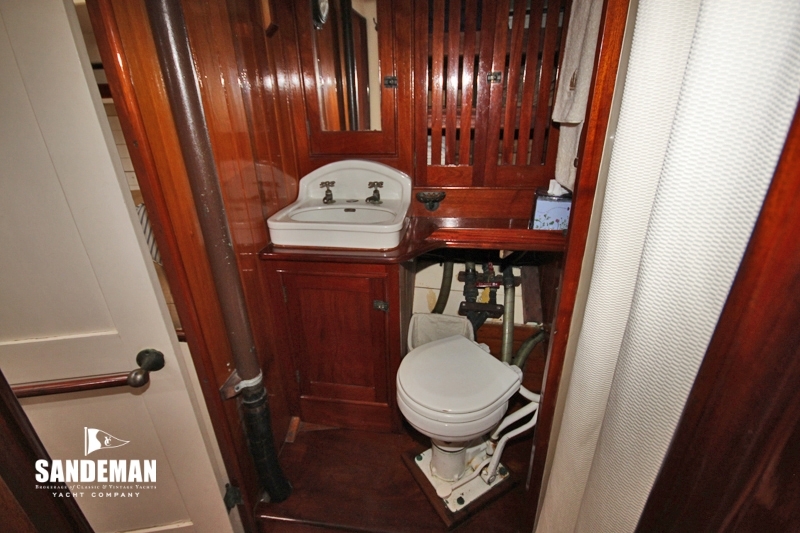 A corridor leads forward with bosun\'s locker and work bench (with complete engine service kit) to port and small head compartment with WC, sink and vanity with mirror. 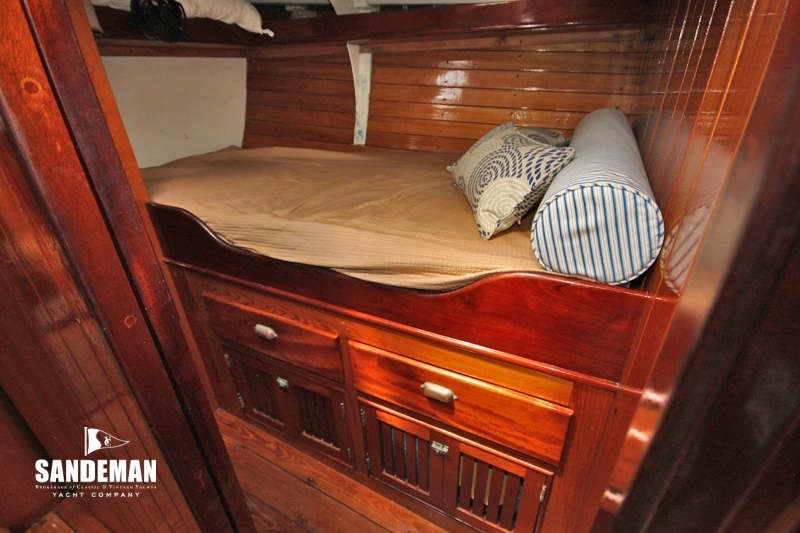 A small double berth cabin has hanging locker, numerous drawers and lockers as well as storage and book cases beneath. A hatch over the hallway and cabin provides ventilation and light. 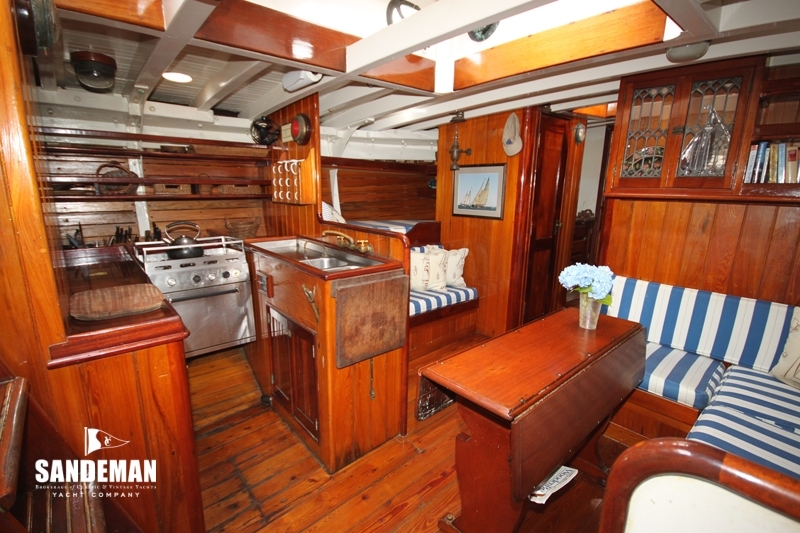 The foc’s’le has a single berth to port and double berth to starboard, 2 hanging lockers, 2 lockers, numerous drawers and under berth storage (for lines), scuttle to deck, deck prism over each bunk; the foc’s\'le is very nicely finished with linen white paint and mahogany joinery and can serve as a guest cabin if necessary. 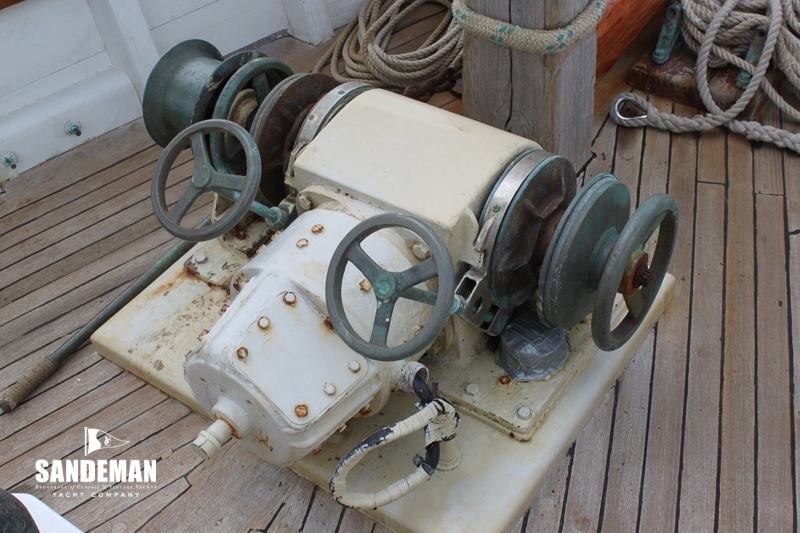 The windlass batteries are located under the berths and the cabin sole. All sails new by Sperry in 2010, area of the four lowers is 1,770 square feet. 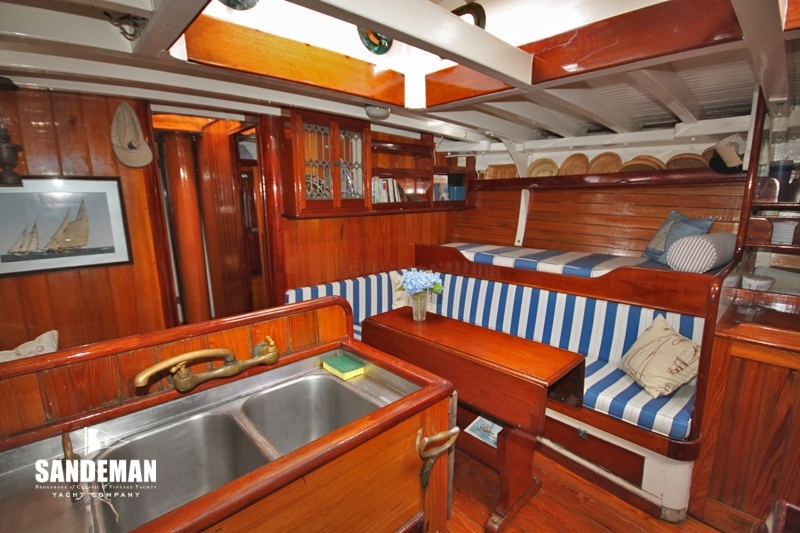 WHEN AND IF has ample space on her laid and sprung teak deck for guests sitting in the self bailing cockpit, on the bridge deck, on cabin tops, etc. 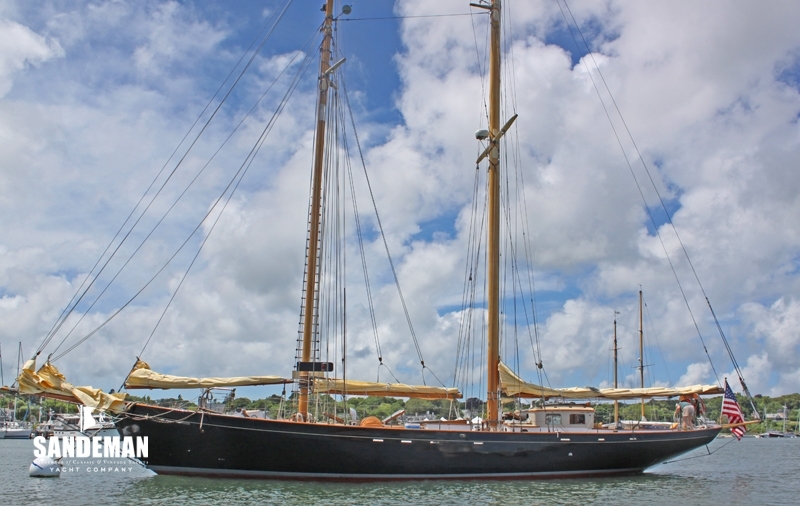 She has wide side decks and high bulwarks which provide an enormous sense of security at sea. The doghouse is accessed from the bridge deck. 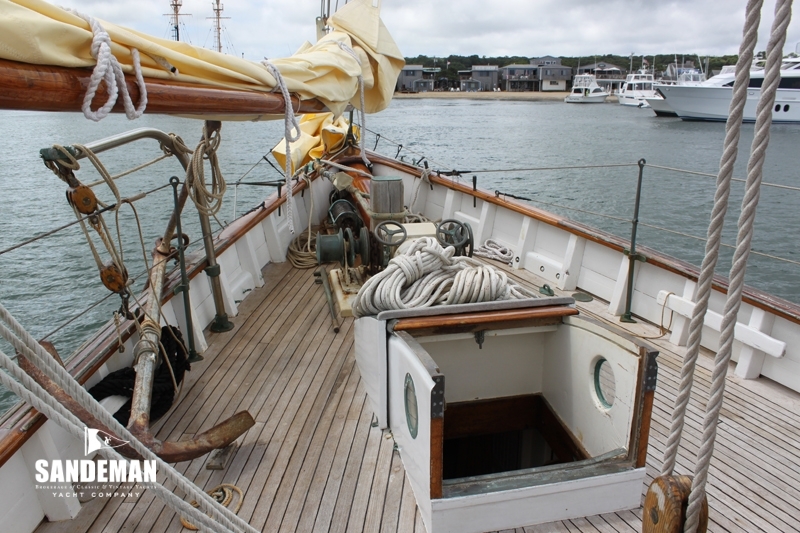 The accommodation hatch and ladder access the aft end of the main cabin, with coach roof over, There is a forward scuttle, then two opening hatches and a butterfly skylight, plus numerous opening port lights in the cabin sides and the doghouse and several dorade vents. 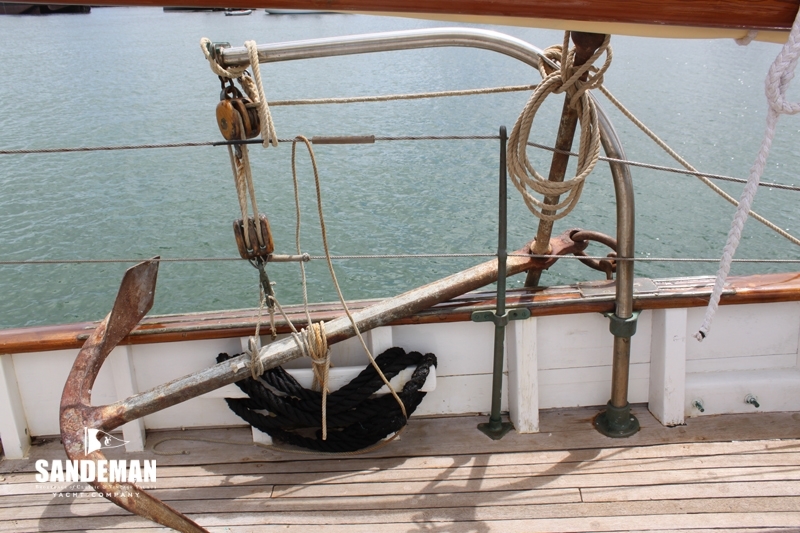 The bowsprit terminates at the forward Sampson post, windlass, anchor davit are to port where the large fisherman is stowed on deck; to starboard is the small fisherman. 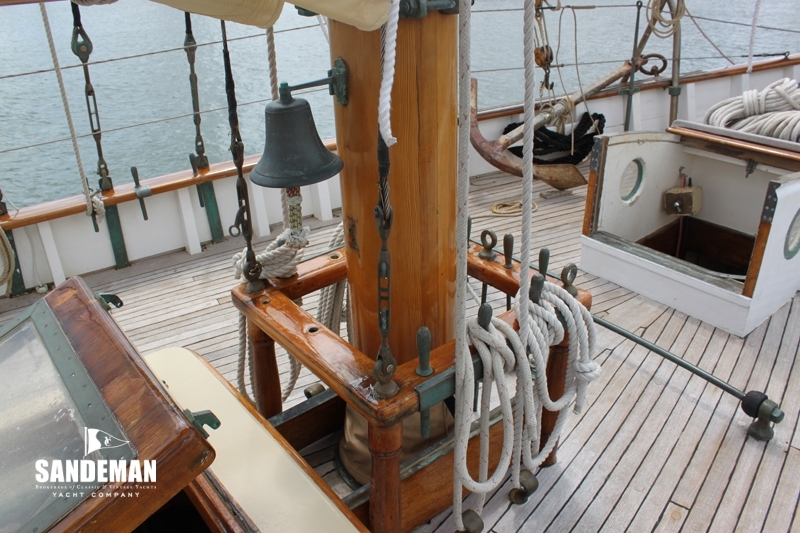 By the fore mast is the original halyard pin rail and the bell, the life raft and the gas bottles are abaft. 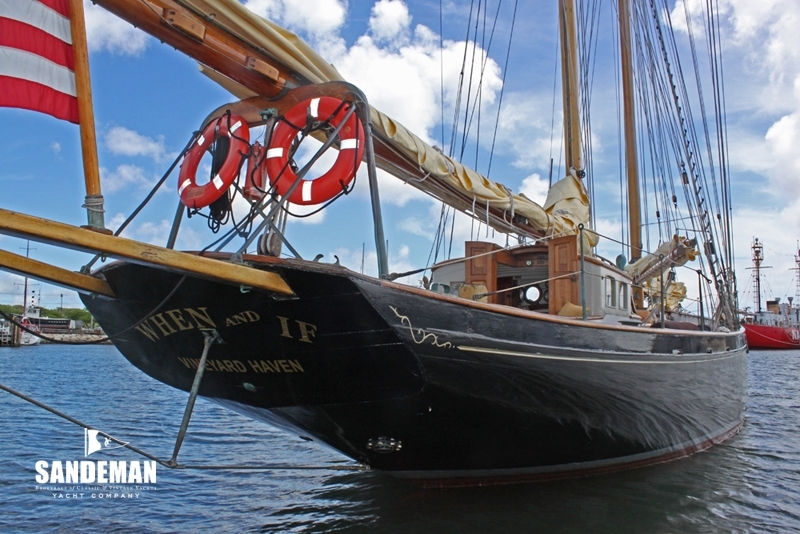 The original construction was immensely strong, hence her survival after the 1990 wreck. 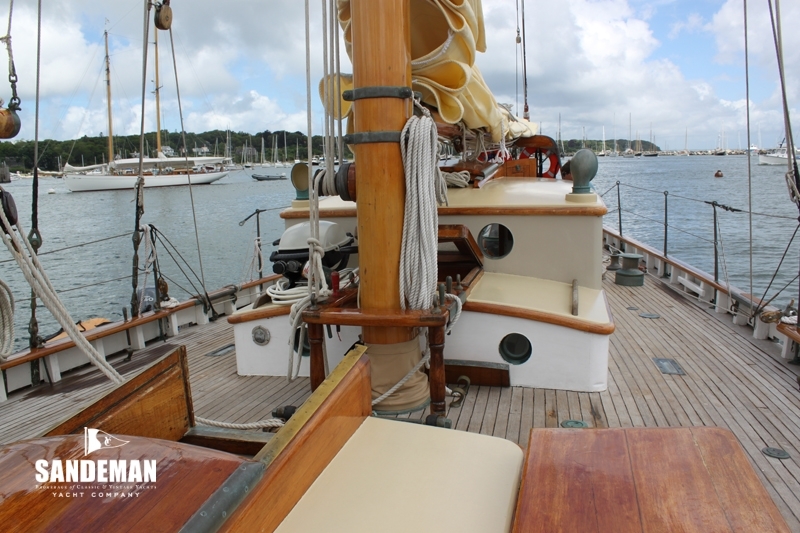 As she had maintained her shape, her rebuilders Gannon & Benjamin of Vineyard Haven, Massachusetts were able to make patterns for the double sawn frames from the corresponding frame on the starboard side rather than lofting the boat\'s lines full size. 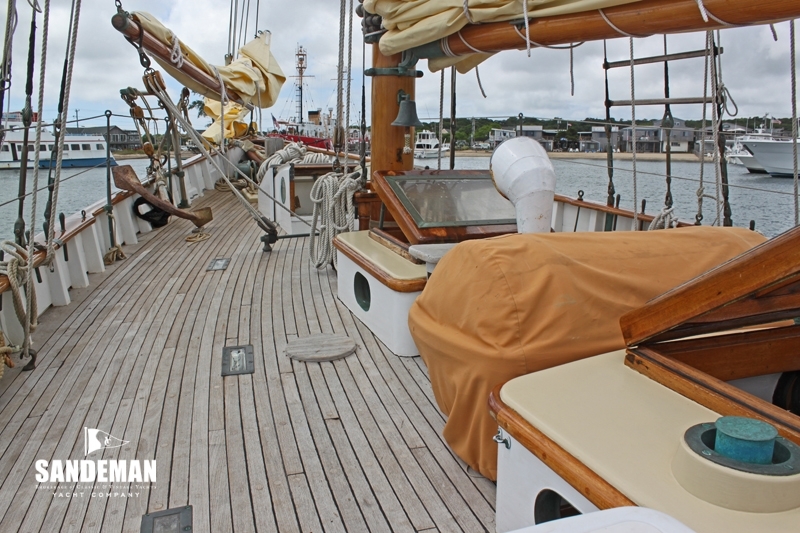 During the rebuild, which took place between 1990 and 1994, about 70% of the planking on the port side was replaced with African mahogany (Khaya) over cedar, bedded in white lead. Seventeen full or partial sawn frames of black locust, bronze drifted together; the bronze hanging knees were either straightened or portions replaced, the cast bronze floors were straightened and reinstalled. 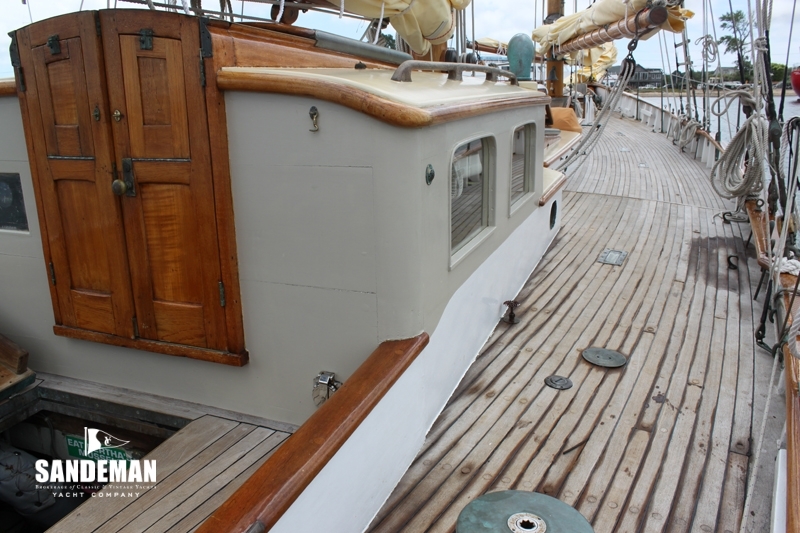 Portions of the dead wood aft, the fore keel, and the rudder were all replaced. 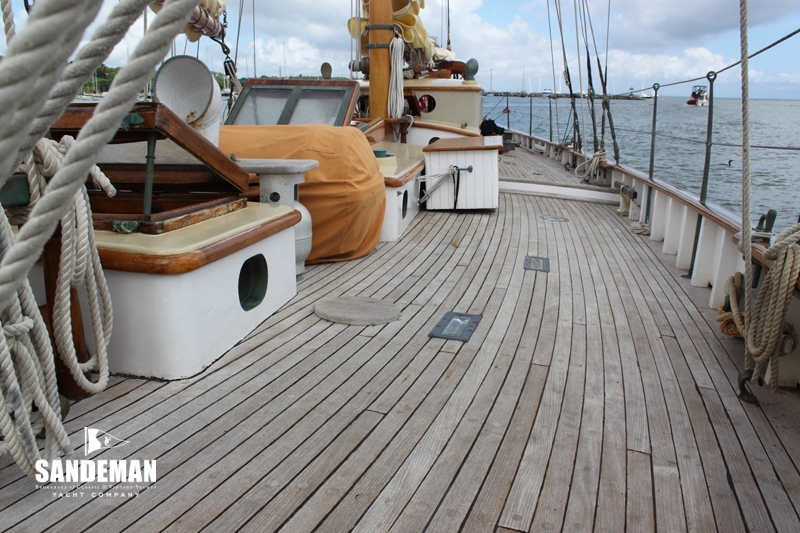 A small portion of the deck was replaced along with the full length of the port bulwarks and rail cap. The water system and tanks were removed and replaced with new components, as were all of the electrical systems, electronics, and batteries. 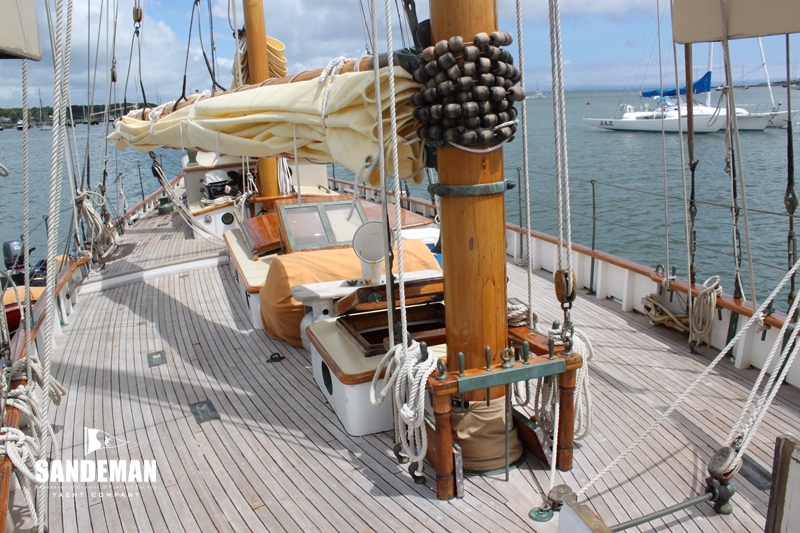 All the standing and running rigging had been removed from the masts, while the hull was rebuilt the mast, booms, and gaffs were stripped, and re varnished. 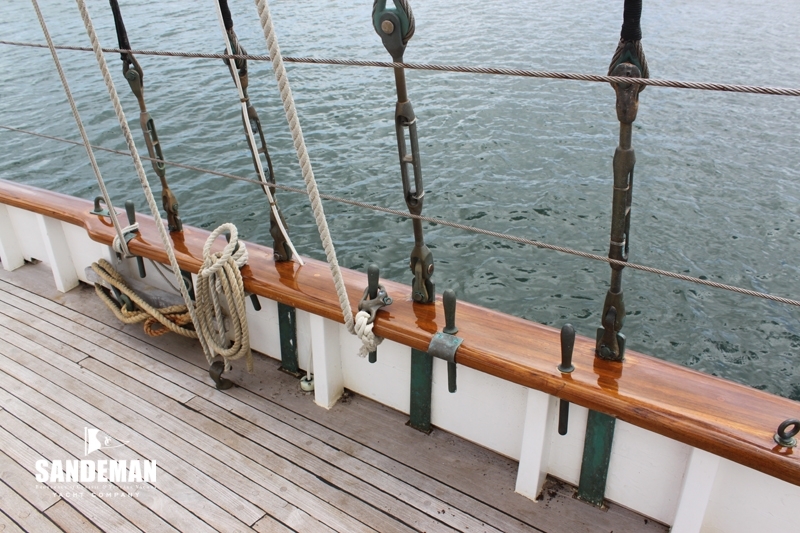 Both the fore and staysail booms have been replaced and now have custom cast bronze hardware. 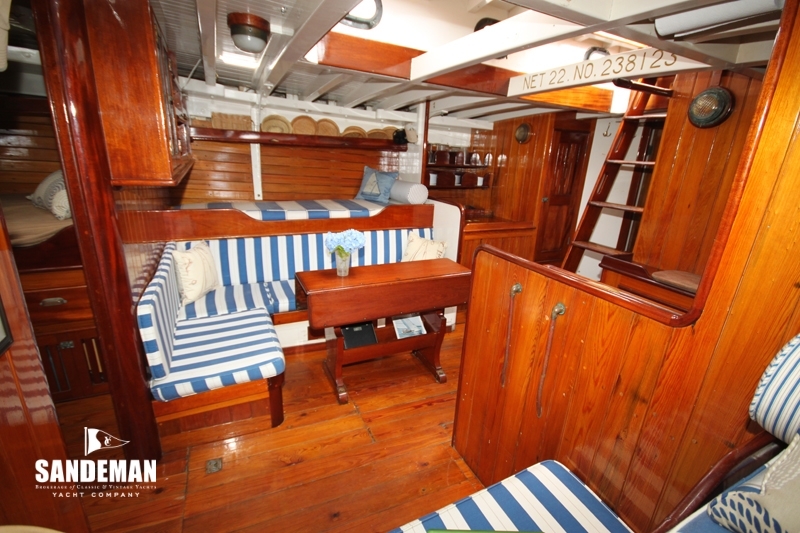 The interior was redesigned to be more comfortable for cruising and chartering and all the mechanical, electrical and plumbing were designed to comply with modern standards. 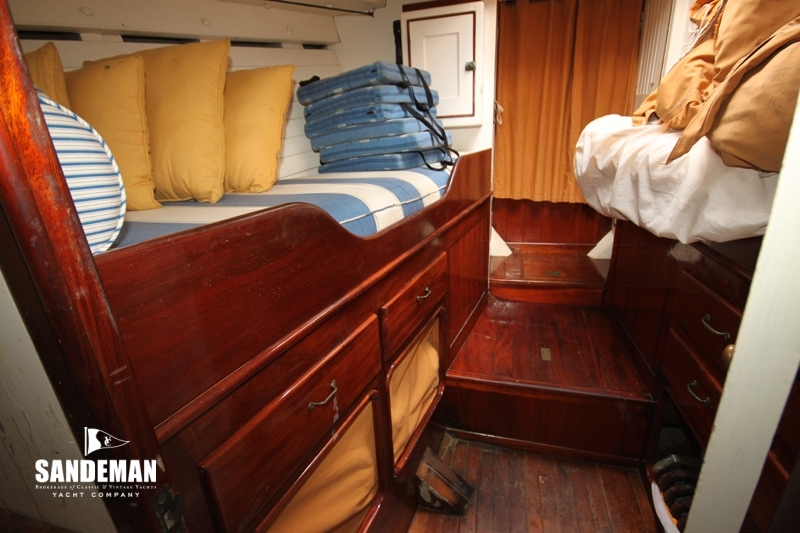 The interior throughout was refinished, along with all new cushions and mattresses. 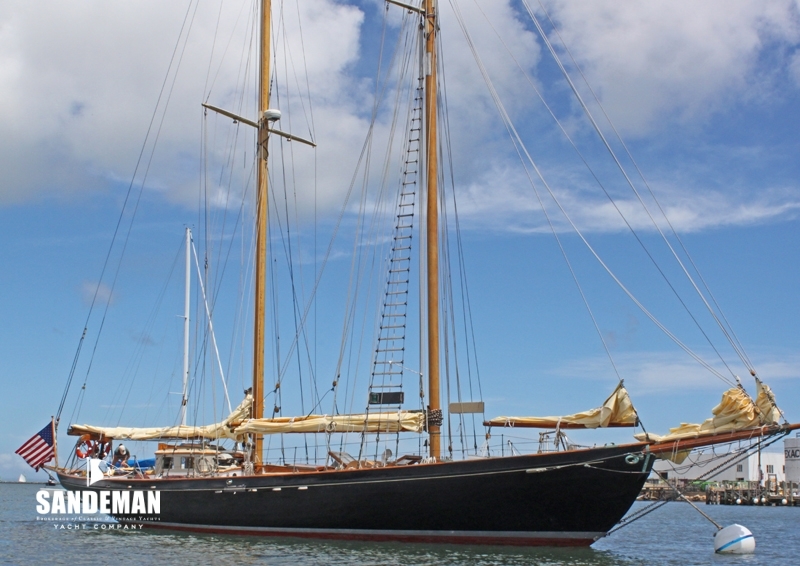 Since the rebuild she has also had new standing and running rigging, fuel tanks and batteries.